What stands out to me is the half-truths of the suggested advantages of the highway system. I will give these proponents the benefit of the doubt. They likely did not see these statements as half-truths. The technology was new and exciting. The repercussions of mobility, distance, fuel consumption, and impending road maintenance had not been explicitly tested against the endurance of the local community; therefore, access to the open road was surely a banner of opportunity, an invitation to lives of efficiency and freedom. C for the City. Turns out that not all city-dwelling kiddos receive milk, vegetables, and fruit. In reality, designing our cities for cars over people has turned zip codes into predictors of health as access to healthy food corresponds with income levels and access to transportation. D stands for Dobbin. Not only Dobbin has been retired and turned out to grass, but so have many of the elderly who live in our sprawling cities. Car dependency has greatly reduced the ability to age in place. By developing retirement homes, we have essentially corralled a sector of our population, isolated them from the larger community, and effectively started an epidemic of boredom and depression among the aged. E for the Engine. Seven-league boots are the whimsy of European folklore. When wearing these magical boots, one step was the equivalent of seven leagues, resulting in great speed. The ironic thing is that the disappearance of these boots could also bring about our corresponding decline in health due to the challenge of walking in our car-dominated towns. F stands for Family. Can we really say that driving to far-distant places has made for healthy children and happy, bright faces? Auto crashes are the leading cause of death among American children. Moreover, ease of mobility has led to the geographic dispersion of families, which, I would argue, contributes to our problems of social isolation and loneliness. Unfortunately, over 80 years later, I am not sure our hindsight vision has cleared much. We are still battling to expose these benefits as only half-truths as we understand the full implications of the auto-oriented life. Will we learn that bigger is not always better? (That’s a humble question---coming from a Texan, no less!) Will growth not always equal expansion? Will proximity not be a limitation on freedom, but an invitation to invest and thrive in local places and communities? 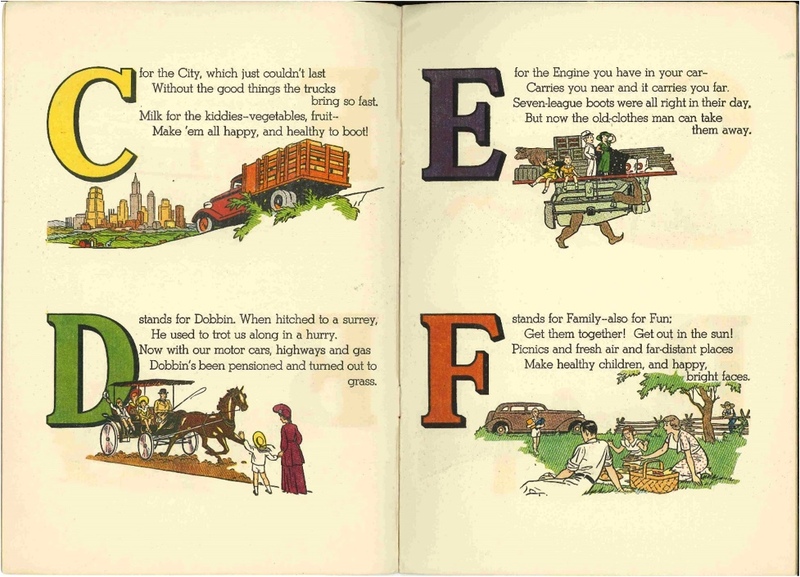 The highway and auto-industry were keen to use the guise of a children’s book to advocate their agenda. The rhymes are catchy and influence is slyly dispensed on both adults and children as the book is read by parents to their children. Slowing down cars so you can play ball. To make neighborhoods safer for children at play. Add your alphabet in the comment section and if you'd like to help us put this together into a book, please email quednau@strongtowns.org. Why stake our hopes on a technology that’s still far from ready for mass adoption? Building walkable cities, where jobs, goods and services are closer together, is a much surer, cheaper, less resource-intensive path to sustainability.